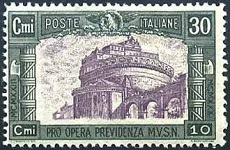 Most of the charity stamps of Italy, for the period between 1924 and 1930, highlight the magnificent cathedrals and some of the World renowned monuments of Rome. Many of the early charity stamps described on this page are very expensive in used condition. One should be very careful when buying higher-priced used condition examples that have not been authenticated! 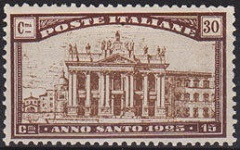 The six charity stamps of Italy shown above (Sc. #B20-25) were issued on December 24, 1924 to celebrate the upcoming Holy Year. The surtax was for Holy Year expenses. 20 C. + 10 C. - St. Maria Maggiore Cathedral. 30 C. + 15 C. - St. John Lateran Cathedral. 50 C. + 25 C. - St. Paul's Church. 60 C. + 30 C. - St. Peter's Basilica and Square. 1 L. + 50 C. - Pope Opening the Holy Door. 5 L. + 2.50 L. - Pope Closing the Holy Door. In the Holy Year 1925, Pope Pius XI wished to direct the attention of the faithful to the outstanding work of the missions, and he asked the faithful to pray for peace among peoples. The four charity stamps shown above (Sc. #B26-29) were issued on October 26, 1926. The surtax was intended for the charitable work of the Voluntary Militia for National Defense. 40 C. + 20 C. - Castle of St. Angelo / Mausoleum of Hadrian. 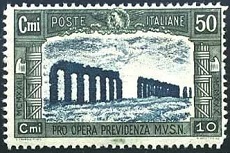 60 C. + 30 C. - Aqueduct of Claudius. 1.25 L. + 60. - The Tabularium in the Ancient Roman Forum. 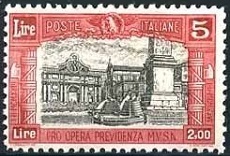 5 L. + 2.50 L. - The Porta Flamina and the Piazza del Popolo. The four charity stamps shown above (Sc. #B30-33) were issued on March 1, 1928. 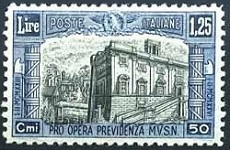 With the exception of the new colors and denominations, the designs are identical to those of the charity stamp issues of 1926 The surtax was intended for the charitable work of the Voluntary Militia for National Defense. The four charity stamps shown above (Sc. #B35-38) were issued on July 1, 1930. With the exception of the differing colors and denominations, the designs are identical to those of the charity stamp issues of 1926 and 1928. The surtax was intended for the charitable work of the Voluntary Militia for National Defense. 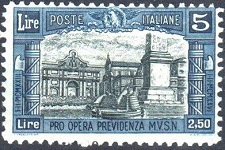 The charity stamp shown above (Sc. 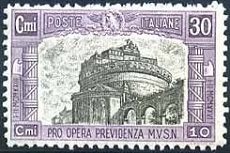 #B34) was issued on January 4, 1929 to commemorate the 50th Anniversary of the Death of King Victor Emmanuel II in 1928. The surtax went to a fund for veterans.